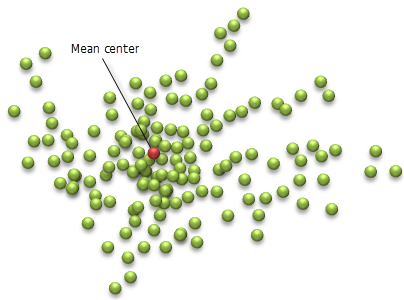 The mean center is the average x-, y- and if available, z- coordinate of all the features in the study area. It's useful for tracking changes in the distribution or for comparing the distributions of different types of features. The Mean Center tool creates a new point feature class where each feature represents a mean center (one for each case when a Case Field is specified). The X, Y and if applicable, Z mean center values, case, and mean dimension field are included as output feature attributes. The Dimension Field is any numeric field in the dataset; the Dimension value in the Output Feature Class is the mean for the values in that field. In the illustration below, the mean center is computed for disease cases in order to identify the possible origin for an epidemic. A crime analyst might want to see if the mean center for burglaries shifts when evaluating daytime versus nighttime incidents. This can help police departments better allocate resources. A wildlife biologist can calculate the mean center of elk observations within a park over several years to see where elk congregate in summer and winter to provide better information to park visitors. A GIS analyst can assess level of service by comparing the mean center for 911 emergency calls to the location of emergency response stations. Or, the analyst can evaluate the mean center weighted by individuals over the age of 65 to determine ideal locations for senior services.